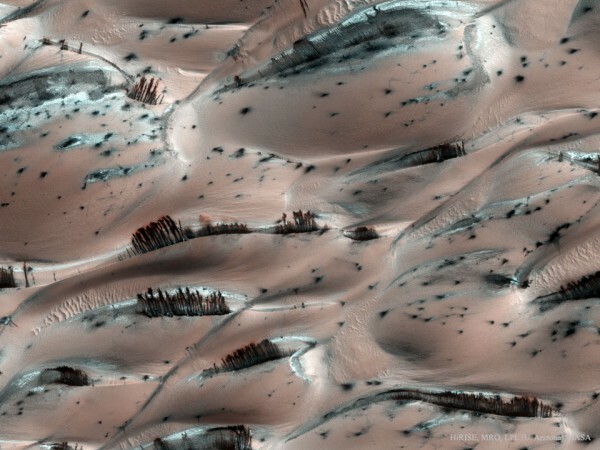 What you see is a photo taken of the surface of Mars by the Mars Orbiter in 2008 and, although it seems that, apart from being very pretty, are abstract trees in a composition is sand dunes. The white that can be seen is simple ice or frozen carbon dioxide since the picture was taken at the north pole of the planet. The brown areas is not more than the sand itself / Planet Earth, which is more visible because of the carbon dioxide that has evaporated from the surface of the sand. In fact, it evaporates, the areas of heaviest sand, fall, making those special pictures that are observed.